In the American South where I have spent a fair amount of my life, the expression ” A Meat & Three ” means home-cooking to anyone looking to fill up on food that makes them think of family meals and Sunday dinner after church at Grandma’s house. 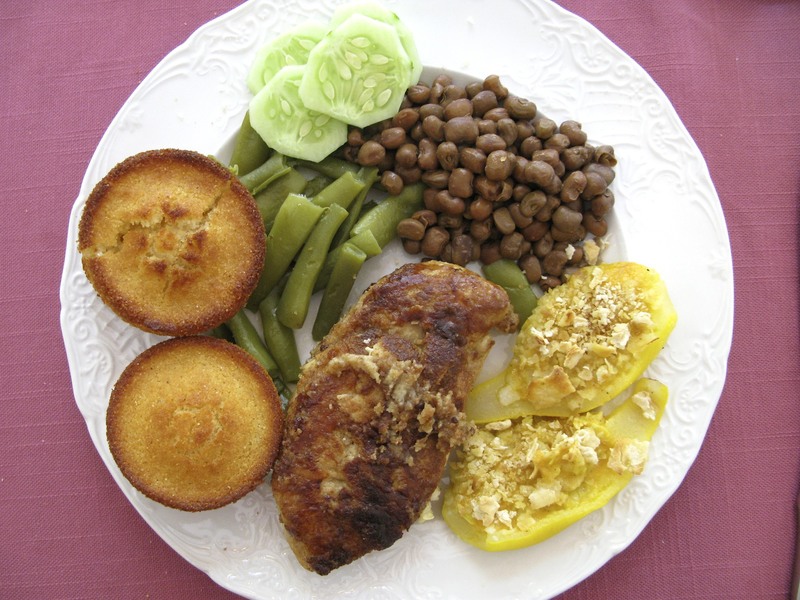 Nobody does this type of meal better than my step-mom Cullene and today after years of enjoying her cornbread muffins, I discovered how she makes them so perfectly crunchy on the outside and soft on the inside. It’s a secret she learned from her mother and I’m glad I took a moment at lunch to find out just how it’s done. I’ve been eating Cullene’s cornbread muffins since I was twelve and only now thought about asking how she makes them so taste so good. This entry was posted in Cooking, Family, Memories and tagged A Meat And Three, Blogging From Georgia, Cornbread Muffins, Cullene Harper, Elizabeth Harper, Gifts Of The Journey, Home Cooking. Bookmark the permalink. I’m a Southern girl and meat-and-three speaks to my heart. Love the picture! Did you make that meal? I would have loved to join you for that dinner! You must share the secret! The only thing missing from this plate is fried green tomatoes. Yum-yum! I’m guessing you had sweet tea with that? what is the meal? and are we to know the secret of the corn muffins? looks fab a lus! Mary Mac’s Tea Room on Peachtree Street. Matthews Cafeteria on Main Street Tucker. The Colonnade on Cheshire Bridge Road. Bit like the British, with their Meat and two veg, which turns out to be Meat and 4 veg and potatoes etc etc, the roast dinner. We have the Yorkshire Puddings, instead of the muffins. Hmmm….is it bacon fat/drippins poured on top? just wonderin’ too. Glad you arrived safely and just also wonderin’….did you get odd looks taking a picture of your food….now that meal was made with love. I am a step mom and find hope in how you kindly refer to Cullene. We must eat at the Colonnade while you are here. Or if you really want to pig out, drive up to the mountains and eat at the Dillard House. We make the corn muffin recipe promoted by Lewis Grizzard. There is mayonnaise in the recipe – makes fabulous muffins! Have never heard of that expression before..but then again – I’m not a southerner. Sounds like this trip back home is evoking all sorts of good childhood memories. As always – love your photos and insight! This is the first that I’d heard the expression “Meat & Three”, it’s a great meal descriptor. My Mom’s cornbread was never that good (too dry), but her spoon bread was amazing. It was a sweeter, moister version of cornbread that is served with a spoon and covered with syrup. Obviously a child’s favorite meal is anything involving syrup, so I loved it. Being a vegetarian I sometimes have a problem with true Southern cooking – not just the meat but the ham hocks and drippings added to flavor the veggies!!! But the cornbread, love it when crispy – guess the best secret is to eat it straight from the oven before it can get dry and tough on the outside. Know you are having a ball here at home – just hope you still enjoy HOT and humid weather because we sure are drowning in it right now! Enjoy every moment dear – just wish I was closer to Atlanta so I could drink iced coffee (I only drink hot tea!) in a cool place with you! Bet John is missing you terribly. My grandmother created a crunchy crust by pouring lard or oil (whatever was on hand) in the cast iron skillet and then heating it up until it was started to smoke–about 15 minutes. THEN she’d pour in the cornbread mix. Yummy. Cornbread and butter are my favorite foods. And yes, I’m a southerner girl–from that part of Texas that is southern (not western). Your mom Cullene is an amazing woman for sure. How did she do all that she did in her life. What a role model! your meal looks absolutely delicious. my favorite are the cornsticks my dad makes in the cast-iron cornstick pan. WAIT are you in Atlanta now?